I’m just back from an enjoyable weekend away in the north east of England, and it gave me plenty of material for blog posts, so stand by for action! I’m going to start off by reviewing a couple of museums I visited, one that was all part of the plan and another that was an unexpected bonus. First off, we visited Locomotion, which is located in Shildon and is effectively a second site for the National Railway Museum, which is based in York. The NRM opened in 1975 and is one of the most popular and successful museums in the country, so I was pleased to see it expand its facilities, and I was also keen to go and see some of the exhibits that now reside at the Shildon site. Given the quality of the NRM, I had high hopes. I’ll start with a bit of history and context. Shildon was a key location on the Stockton and Darlington Railway, which opened in 1825 and was the first public railway in the world to be operated entirely by steam locomotives. Both railways and locomotives weren’t new by this time, but the Stockton and Darlington combined a whole range of features that arguably made it the first modern railway in the world. The museum opened in 2004, and is housed on the site of a major wagon-building workshop that closed in the 80s, and nearby a locomotive works built many pioneering steam engines. Arriving by train, we followed the signs to the start of the trail that runs around the large museum site, arriving at the Welcome building located in the street outside. It’s apparently an old Sunday School building, and would have served the families of railway employees in the town over the years. There was an interpretive board outside, which was quite informative, but the building itself was firmly locked. It was only afterwards that I found out it contains some very significant exhibits, so quite why it was closed, I don’t know. The same also applied to the cottage built by the S&DR for Timothy Hackworth, its locomotive engineer. It’s a beautiful old building, disfigured by an ugly modern sign outside, and also inaccessible. Things improved a bit when we got inside the main grounds of the museum complex, and there were some interesting buildings present, like a stone goods shed, a parcels office and some coal drops, under restoration. There’s also quite a long section of track out here, and when various works have been completed, there are plans to operate steam locos and offer train rides, which will greatly improve the offer to visitors. So, that’s quite positive. They have a big site, and clearly there are good plans to do things with it. It’s also hosted quite a few special events over the years, and has the bonus of being connected to the national rail network, so bringing visiting trains in is fairly simple. There’s a few sidings outside the main museum building, containing miscellaneous bits of rolling stock in various stages of restoration. Some are more interesting than others, but it provides a few things to look at before going into the main building. This contains many of the things I was very keen to see. Sidings outside main building at Locomotion. Unfortunately, I soon discovered some very significant flaws in the way the museum is arranged, and they really spoiled my enjoyment. 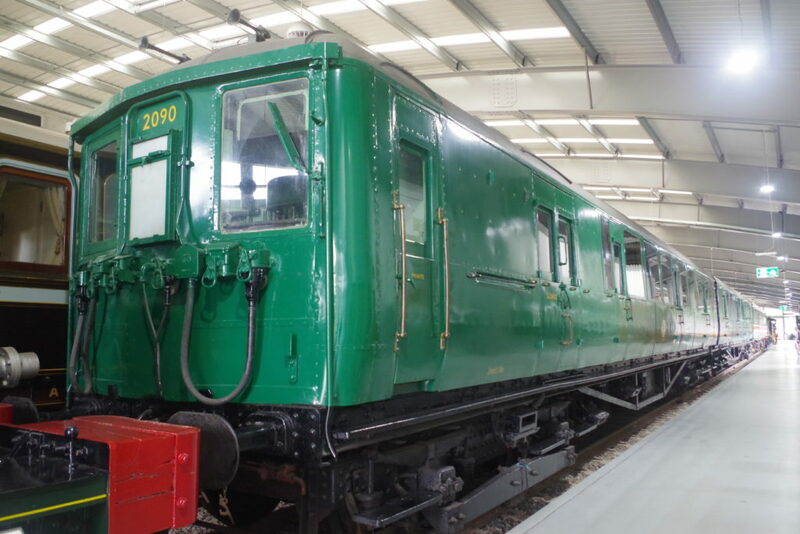 I’ll start with one of the main items I wanted to view – a 1930s electric train, the Southern Railway 2-BIL. When I was a kid, this used to appear at a few open days, and it even ran on a few tours, but it can’t be used on the main line any more as most of the body framing is made of wood, and it doesn’t meet modern crashworthiness standards. It ended up stored in the open for a while and suffered some damage, but some restoration took place, and I was keen to see it again. Despite there being a lot of space available in the building, it’s stored with other exhibits crammed right up at both ends, making it very difficult to photograph, and it can only be viewed from floor level. I therefore couldn’t see inside, which is a problem with almost all the exhibits. There was no information to tell visitors much about the train, and the exhibits around it were completely unrelated to it. 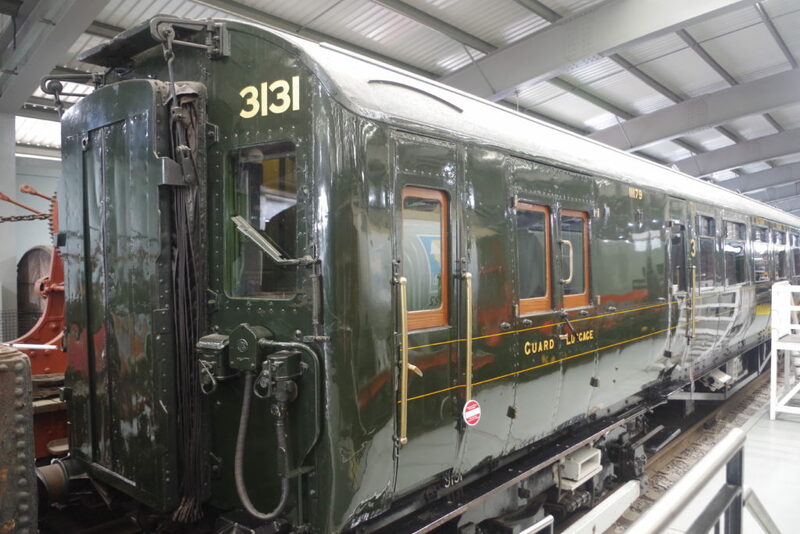 There were lots of other items with a Southern Railway connection in the museum, including another electric coach, an electric and a steam locomotive, and a Night Ferry sleeping car, but they were all scattered about in other locations. If they’d been grouped together, they’d have made a great themed exhibit and told an interesting story about the Southern’s unique features, but viewed in isolation, with poor information provided, you’d never know what they were or how they were connected. Southern 4-COR motor coach. Would be an ideal partner for the 2-BIL, but was nowhere near it. The access-from-floor-level-only thing is a problem throughout. A few exhibits have platforms allowing you to get a better view inside, but there’s nowhere near enough of these provided. A key exhibit is the 1970s experimental Advanced Passenger Train (APT-E). 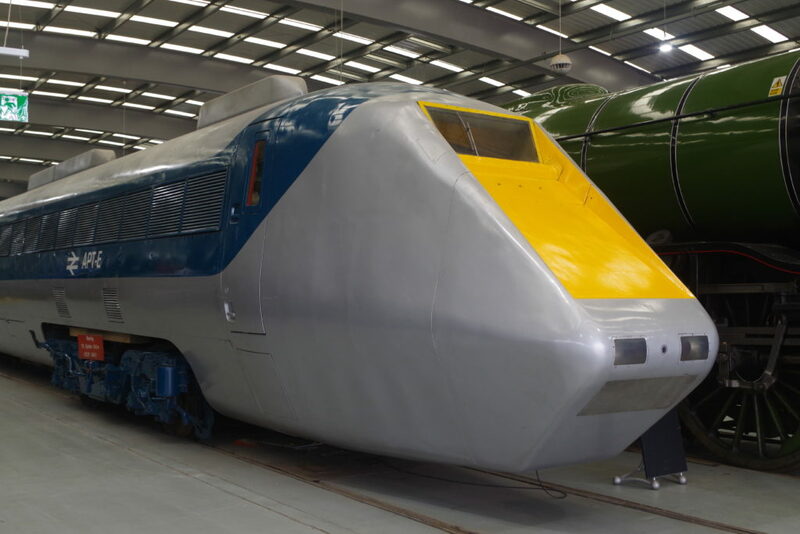 Although the APT project was abandoned and is widely considered one of British Rail’s failures, the gas-turbine powered experimental train broke loads of speed records and is an incredibly striking piece of kit. Currently it’s impossible to see inside, which is a real shame as the interior is fascinating, full of old test equipment and with a rather sumptuous VIP seating area. It’s good to see some work being done on restoration, but the lack of access is shocking. At least this train does have some information displays around it. 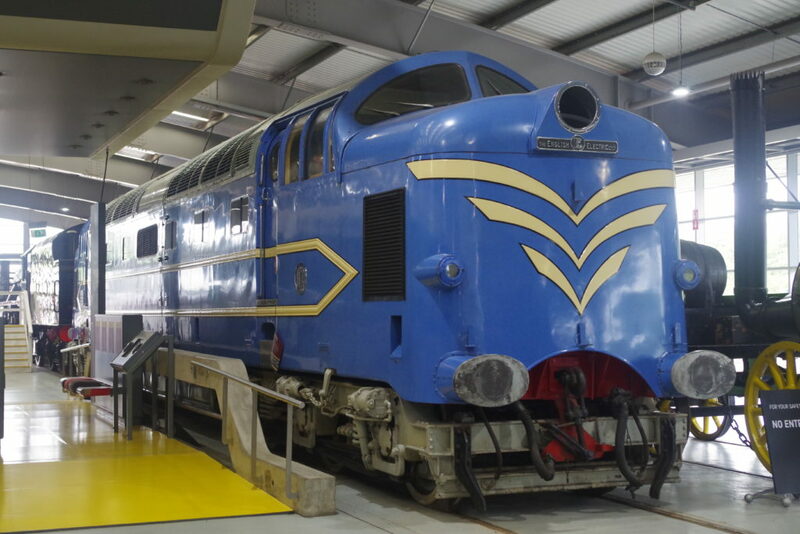 The prototype Deltic locomotive again doesn’t get very well displayed, with a lack of information about its historical significance – the first diesel locomotive in this country capable of prolonged 100mph running. They were instrumental in slashing journey times from London to Edinburgh. It just sits on its own, looking a bit lonely. Lonely Deltic. Distinctive looking beast – it used to be in the Science Museum in London when I was a kid. There were plenty of other interesting locos and coaches, but again they were rather randomly squashed together with no effort to really show them off properly, or tell people what they were for. 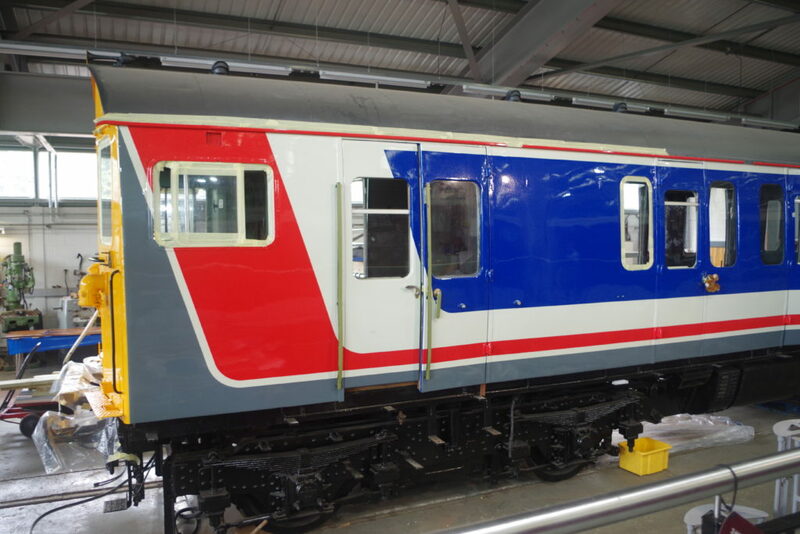 On a more positive note, it was good to see some restoration work going on, with an electric train being restored to pristine 1980s appearance in Network SouthEast livery. Electric trains are rather under-represented in preservation, as you can’t generally run them anywhere, so many end up being scrapped. This particular unit, a Class 414, is a type I remember from trainspotting as a kid, and had a few rides on. The 1980s also tend not to be depicted very well in preservation, so the decision to commemorate British Rail’s bold attempt to build a railway brand for London is to be commended. It gleams! Partner to the rather faded vehicle outside. Being charitable, I’ll try and set the disappointments aside and reflect on the positives. The town has suffered greatly from industrial decline and poverty, so anything that brings people, money and jobs to the area has to be welcome. I wouldn’t have visited the area if it wasn’t for the museum. There’s a nice café, lots of space to explore, and it’s free to get in. Development of the museum saw the local station get a complete rebuild and service frequencies were increased, so it’s clearly been a boon for the area. It’s difficult balancing the differing demands of enthusiasts and the more general visitor, and I appreciate I’m quite hard to please, but even small improvements that would be very cheap to carry out would make the museum far, far better. I feel it needs a more organised collection, and on the days when it’s open, all the facilities need to be available. It could tell such an interesting story, but at present it just feels like a rather random collection of stuff, presented without enough context or care. 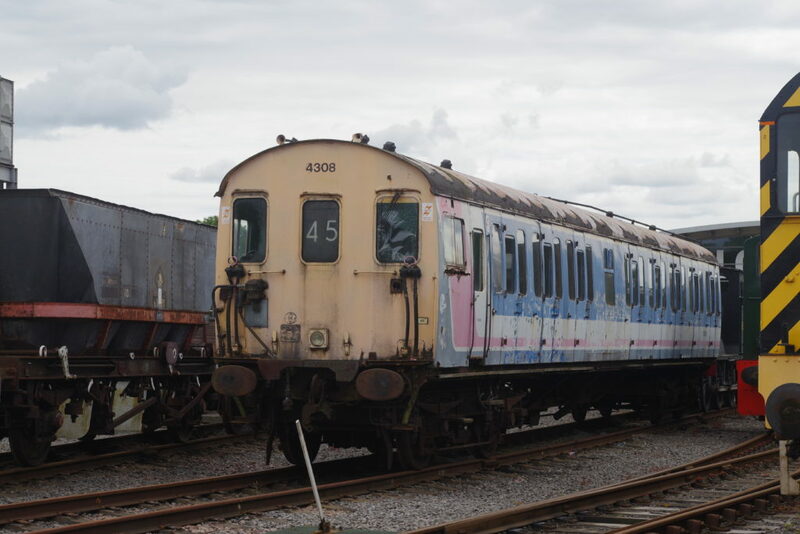 The site seems to act more as a storage site for things that won’t fit at York, which is fair enough as the London Transport Museum has a similar secondary facility at Acton, but they make it clear what to expect on a visit. I feel Shildon is perhaps hyping itself up a bit, and not really giving prospective visitors a clear idea of what to expect. The “bonus” museum was Head of Steam, located at North Road station in Darlington. As I say, I had no idea it was there, and only discovered it as we passed on a train en route to Shildon. We had enough time to drop in, and I have to say this was an altogether much more positive experience. North Road was the original Stockton and Darlington Railway station in the town, and as only a small part of it is now used by regular trains, much of the rest of the site is now a museum. It’s run by the local council and adult admission is a fiver, but I’d say it’s well worth the money. For a start, the museum has an over-arching theme, putting the exhibits in context and telling a story. It’s all about Darlington’s history, and how the railway developed and made an impact on the area. There’s a path around it that shows things off in chronological order. As well as some historic locomotives, there’s objects like old sections of track, posters, a huge model of various Stockton and Darlington Railway locations, and a room full of railway posters through the ages. There’s even a collection of Victorian urinals! 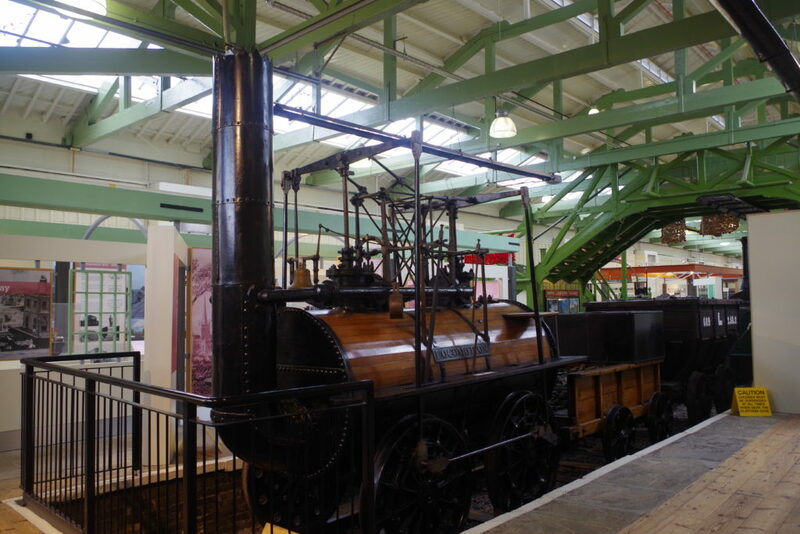 Locomotion, the Stockton and Darlington’s pioneer locomotive. 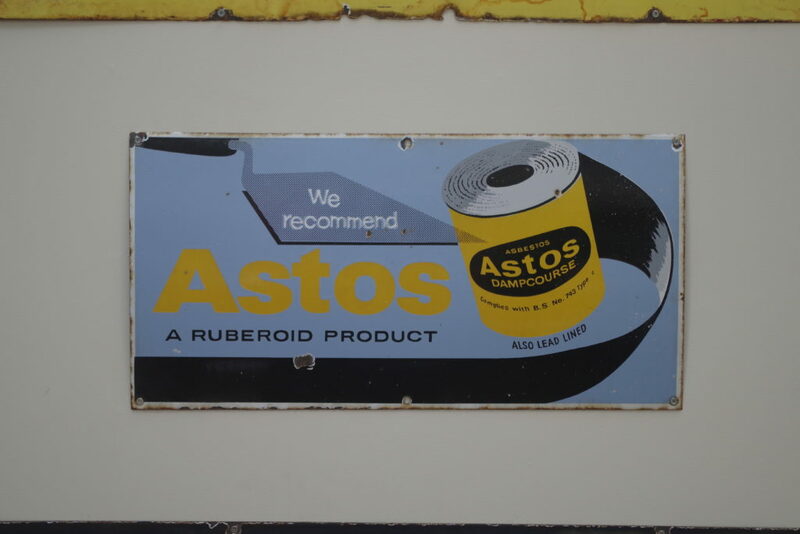 Asbestos and lead. I’m sure this product is completely harmless and will not lead to lung disease and insanity under any circumstances. Although it’s much smaller than Locomotion, I’d say it’s a much more worthwhile experience, because it’s not just a bunch of random stuff plonked in a big space without much thought. It’s easier to build a personal connection with the stuff on display, as you can see what it was for and how it was used. This is surely the mark of a good museum – it broadens your horizons a bit. Sadly, I’ve seen good museums go bad, and a particularly gruesome example is what happened when the Glasgow Museum of Transport closed, and reopened in a new building as the Riverside Museum. Gone were accessible, varied themed collections you could have a really good look at, replaced by a huge space that looked like a bomb had gone off in a warehouse. It’s the most jarringly random, chaotic collection I’ve ever seen, and trying to actually look at specific things is almost impossible. Most of the cars are stacked up on a wall, right up to the very high ceiling – gone are the days when you could walk around them and look inside. It has to be said I’ve never seen so much money spent so badly – if you’re in the area, give it a miss and try the Museum of Scottish Railways instead. They’ve worked miracles on a shoestring, and it’s so much better.